St Brendans won the County Intermediate hurling title for the first time in 17 years when overpowering a very game Kilgarvan side in an entertaining game at Lewis Rd on Saturday evening. Corner forward, Breandán O’Connor was the main architect of the South Kerry side’s downfall with 2-9 to his credit but overall the Ardfert side had too much strength around the field. The sides shared a point apiece in the opening passages before Kilgarvan struck for the first goal of the match through Kieran O’Sullivan in the third minute and when John Mark Foley pointed soon after they were 1-2 to 0-2 to the good. Sean Godfrey, who was a threat to the Brendans defence all through, was denied a goal by TJ Stack in the 14th minute and Jack O’Brien was just wide with another goal chance soon after as Kilgarvan enjoyed their best spell of the match. However, when the goal came it was at the other end when Shane Griffin cut in from the left to give Flor O’Brien no chance in the 15th minute and a minute later Breandán O’Connor scored 1-1 within a minute to put Brendans 2-5 to 1-4 ahead. In the 22nd minute, Jack McCarthy got in on the goalscoring act and the winners added four further points before the break, 3 of them from Breandán O’Connor, to lead by 3-10 to 1-5 at the interval. Sean Godfrey gave Kilgarvan hope with two points within as many minutes of the resumption but Breandán O’Connor and Shane Griffin responded for the winners before Gearoid Sheehan got their 4th goal of the game in the 39th minute. At 4-11 to 1-8 this game was over as a contest but to be fair to Kilgarvan, they kept plugging away with scores from John Mark Foley and Sean Godfrey and the score was 4-13 to 1-9 at the three quarter stage. For the remainder of the game we were treated to some fine score by both sides with Breandán O’Connor for St Brendans and John Mark Foley from placed balls for Kilgarvan excelling and Godfrey got in for a much needed goal for Kilgarvan in the 24th minute. It was a case of too little too late however and St Brendans ran out deserving winners. 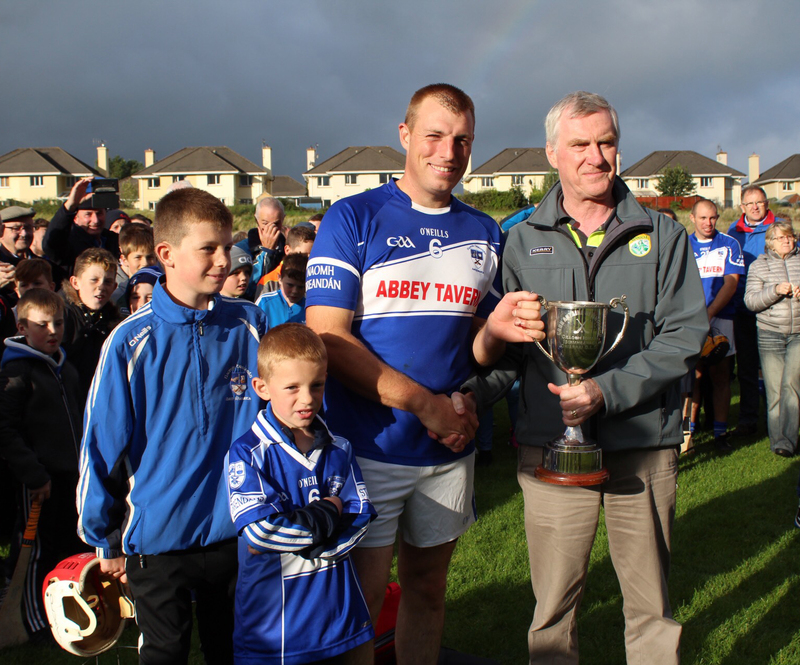 After the game, County PRO John O’Leary presented Corn Antaine Uí Mhurchú to winning captain Denis Moriarty. St Brendans corner forward, Breandán O’Connor was named The Rose Hotel Man of the Match and he will be presented with his award by manager Mark O’Sullivan in the Rose Hotel at a future date. St Brendans: Breandán O’Connor 2-9 (0-4 frees), Shane Griffin 1-4, Jack McCarthy and Gearoid Sheehan 1-0 each, Padraig Kearney, John Galvin and Kieran Fitzgerald (free) 0-1 each. Kilgarvan: Sean Godfrey 1-5 (0-4 frees), Kieran O’Sullivan 1-1, Patrick O’Shea 0-2, Conor Shortall and Gearoid Fennessy 0-1 each.